The ironSource Rewarded Video ad unit offers an engaging ad experience that rewards your users with valuable virtual content in exchange for a completed view. This user-initiated ad unit is great for gaming apps; and enhances every app experience! Make sure you have correctly integrated the ironSource SDK as well as any additional ad network adapters into your application. Integration is outlined here. The ironSource SDK fires several events to inform you of ad availability and completions so you’ll know when to reward your users. //Called after a rewarded video has changed its availability. //@param available The new rewarded video availability. YES if available //and ready to be shown, NO otherwise. //Change the in-app 'Traffic Driver' state according to availability. // Invoked when the user completed the video and should be rewarded. // If using server-to-server callbacks you may ignore this events and wait *for the callback from the ironSource server. // @param placementInfo An object that contains the placement's reward name and amount. //Called after a rewarded video has attempted to show but failed. //Called after a rewarded video has been opened. //Called after a rewarded video has been dismissed. //Note: the events below are not available for all supported rewarded video ad networks. Check which events are available per ad network you choose //to include in your build. //We recommend only using events which register to ALL ad networks you //include in your build. //Called after a rewarded video has started playing. //Called after a rewarded video has finished playing. Called after a rewarded video has changed its availability. @param available The new rewarded video availability. YES if available and ready to be shown, NO otherwise. Called after a rewarded video has finished playing. Called after a rewarded video has started playing. Called after a rewarded video has been dismissed. Called after a rewarded video has been opened. Called after a rewarded video has attempted to show but failed. Called after a rewarded video has been viewed completely and the user is eligible for reward. @param placementInfo An object that contains the placement's reward name and amount. ironSource provides an error code mechanism to help you understand errors you may run into during integration or live production. See the complete guide here. Please do not assume the callbacks are always running on the main thread. Any UI interaction or updates resulting from ironSource callbacks need to be passed to the main thread before executing. *Called after a rewarded video has changed its availability. *@param available The new rewarded video availability. YES if available *and *ready to be shown, NO otherwise. With ironSource Ad Placements, you can customize and optimize the Rewarded Video experience. 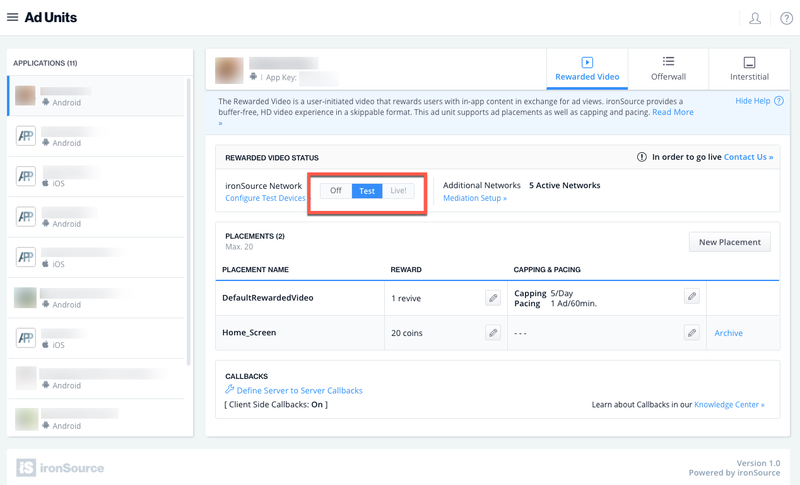 This tool allows you to present videos to users at different locations within your app, and customize the reward amount for each placement. You can use the below function to define the exact place within your app to serve an ad. Navigate to the Ad Placement document for more details. In addition to ironSource‘s Ad Placements, you can now configure capping and pacing settings for selected placements. Capping and pacing improves the user experience in your app by limiting the amount of ads served within a defined timeframe. Read more about this feature here. Important Note! To ensure you don’t show the traffic driver (Rewarded Video button) to prompt the user to watch an ad when the placement is capped, you must call the below method to verify if a specific placement has reached its ad limit. When requesting availability, you might receive a TRUE response but in the case your placement has reached its capping limit, the ad will not be served to the user. Note: In the case the placementName parameter is null, the SDK will retrieve the default placement settings configured on the ironSource platform. The Dynamic UserID is a parameter to verify AdRewarded transactions and can be changed throughout the session. To receive this parameter through the server to server callbacks, it must be set before calling showRewardedVideo. You will receive adynamicUserId parameter in the callback URL with the reward details. Each time the user successfully completes a video, the ironSource SDK will fire the didReceiveReward event. Upon reward, you will be notified with the delegate function below. //Called after a rewarded video has been viewed completely and the user is //eligible for reward. //@param placementInfo is an object that contains the placement's reward //name and amount. Called after a rewarded video has been viewed completely and the user is eligible for reward. @param placementInfo An object that contains the placement's reward name and amount. Note: The didReceiveReward and rewardedVideoDidClose events are asynchronous. Make sure to set up your listener to grant rewards even in cases where didReceiveReward is fired after the rewardedVideoDidClose event. The default setting in your ironSource account is to notify you of user completions/rewards via the didReceiveReward callback within the client of your app. Additionally, if you would also like to receive notifications to your back-end server, you can turn on server-to-server callbacks. If you turn on server-to-server callbacks, remember not to reward the user more than once for the same completion. We will be firing both the client-side callback and the server-to-server callback, so you will get two notifications for each completion. To utilize server-to-server callbacks, see here. You are now all set to deliver Rewarded Video in your application.